Cannabinoids aren’t just something you put in a pipe and smoke– our bodies make them naturally. In fact, without them, it’s unlikely we would have become those first few divided cells in our mother’s womb. The Endocannabinoid System (ECS) is the primary regulatory network responsible for the creation and break down of these endogenous or endo-(of the body)cannabinoids. Often referred to as the “bridge between mind and body,” the ECS mediates key physiological and cognitive functions like mood, immune function, pain sensation, appetite, sleep, and metabolism. The ECS is found in the central and peripheral nervous systems. It’s a complex network comprised of receptors (CB1 and CB2), endogenous cannabinoids (which function similarly to the plant-derived, or phyto-cannabinoids THC and CBD) and enzymes that both create and break down those cannabinoids within the body. While so far only the CB1 and CB2 receptors are considered designated ECS targets, there are a number of other identified pathways in our bodies that both endocannabinoids and phytocannabinoids can act on, with potentially more still awaiting discovery. For now, let’s take a closer look at the foundations of the system we actively engage with each time we take a puff … or just a deep breath. The ECS was only just discovered in 1988, and we learn more each day as research all over the world picks up with the tides of legalization. Until recently, the science has focused on two main mechanisms of ECS action: the CB1 and CB2 receptors. They’re like docks that endocannabinoids, phytocannabinoids, and even some terpenes can attach to. Cannabinoid (CB) receptors are found in virtually every major system in the body— from our brain to our reproductive organs, connective tissues, nervous system, to bones and skin. CB1 receptors are found mainly in our central nervous system (the spinal cord and brain). Their activation is associated with cerebral and behavioral effects, and they play a direct role in memory and cognition, emotion, motor control, appetite stimulation, and perception of pain. THC has a natural affinity for the CB1 receptor, which explains why we might experience euphoric mood changes or cognitive impairment when we consume it. But THC is just a supplement for our body’s own “bliss” molecule, called anandamide, the endogenous cannabinoid that interestingly binds to CB1 just like THC does. The CB1 network has particularly large implications for human behavior, because of its role in mediating our reward system (thus our motivation, and ultimately our actions). As teams of neuroscientists and psychologists get closer to unraveling the mystery behind THC’s effects, it’s becoming clear that a more precise understanding of CB1 function could offer tremendously valuable insights into human psychology, PTSD, the Opioid Crisis, and addiction research more broadly. Diverse areas of study have taken a great interest in the CB1, like neurology, psychopharmacology and mental health research; as anxiety disorders, PTSD and dependency-related issues (among others) are associated with the reward pathway system. CB2 receptors are located mostly in the peripheral nervous system, and are especially associated with the immune system and inflammation response. Because they’re most concentrated in our body’s periphery, their stimulation doesn’t result in any heady euphoria or intoxication. Activating the CB2 can relax the body, help it repair itself and reduce the sensation of pain without impairing cognition. Researchers are currently trying to figure out how to selectively target the CB2 receptor— which would be a huge boon to those seeking pain relief without unwanted psychotropic effects that result from stimulating the CB1. 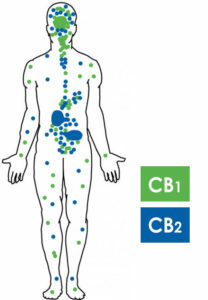 When THC binds to the CB2 receptor, it has shown potent anti-inflammatory and analgesic (pain relieving) properties. Beta-caryophyllene, a terpene found in black pepper and many varieties of cannabis, is thought to have potent anti-inflammatory effects and appears to readily bind to CB2 receptors. This might help explain the cross-cultural popularity of black pepper in folk medicine treatments for inflammatory gastrointestinal issues. It’s also interesting to note that other plants, not just cannabis (after which the ECS was named) can interact with our ECS. The CB2 receptor is of particular interest in research targeting pain management (acute, chronic and neuropathic) and numerous inflammatory conditions and diseases. In cannabis literature, it’s often said that cannabinoids fit into CB1 and CB2 receptors like a “lock and key.” THC certainly appears to, but not all cannabinoids interact with these receptors the way THC does. 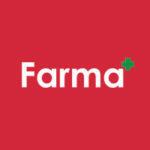 Take our favorite non-intoxicating compound– cannabidiol (CBD)– for instance. In its isolated form, CBD has no affinity for CB1 and only some affinity for CB2— it does its important work mostly elsewhere. And it’s not just CBD. Research has shown that a handful of other cannabinoids also don’t have any affinity for CB1 and CB2 receptors, but that they might work on at least 15 other channels in the body. We’re constantly learning more about how these secondary channels (like PPARs, GPRs, and TRPs, to name a few) engage the ECS, both directly and indirectly. Might there also be other CB receptors science hasn’t identified yet? Probably. Our endocannabinoid system is like a thumbprint– everyone’s is a little different. It’s why tolerance varies so widely from person to person, and why everyone experiences the cannabis high a little differently. Since the experience of CB1 activation is so subjective, we’re likely a long way away from being able to accurately predict or generate specific psychotropic effects of high-THC varietals. Fortunately, however, when it comes to the CB2, physiological effects like reduced pain and tension release aren’t as subjective. For those looking for effective pain relief with minimal or manageable (per your tolerance) intoxication, it is helpful to know how THC and other cannabinoids interact with these receptors. With a better working knowledge of the ECS, patients can make more informed decisions when faced with the dazzling variety of products at the local dispensary. –1:2 CBD caramels by Periodic Edibles; delicious, long-lasting, whole plant cannabutter caramels with added beta-caryophyllene to help target inflammation. –Goji OG by Gnome Grown Organics; a sweet smelling high-THC varietal that packs an anti-inflammatory punch with muscle-melting terpenes myrcene and beta-caryophyllene aplenty. A staff favorite of late, it’s also a real giggler. –Corazon by Yerba Buena;a myrcene-rich 1:20 varietal packed with minor cannabinoids and terpenes. It’s minimally intoxicating and great for daytime use. Pro-tip: it’s also a great “mixer”– you can add it to high-THC varieties for a more customized THC:CBD ratio.